Two recent college graduates. A person who inspires and prepares future Promise scholars. And others who then hire them. 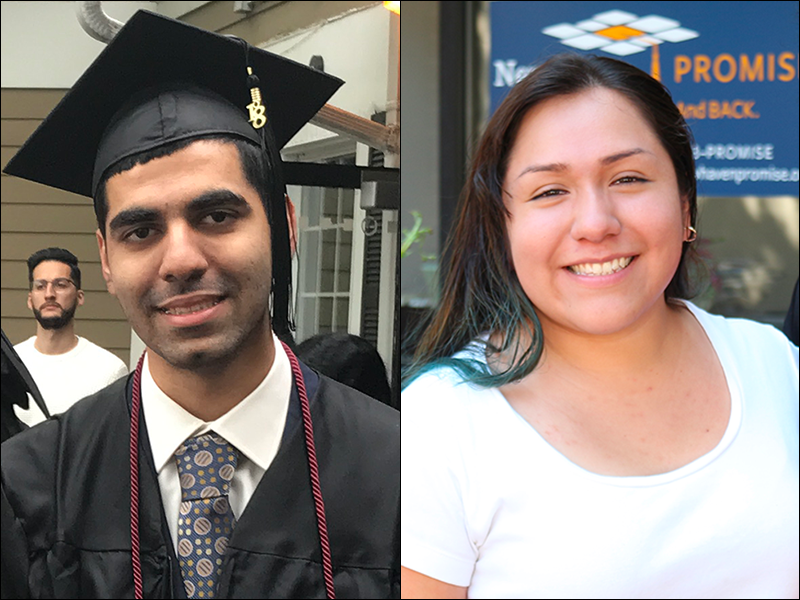 That is a snapshot of the 2018 New Haven Promise Award winners who will be feted at the eighth annual Scholar Celebration to be held on August 16th at the Lyman Center on the campus of Southern Connecticut State University. The longest-standing honor — the Legacy Award which is given to Scholars who have recently graduated from college — rewards those who have demonstrated a deep commitment to their studies, fellow Promise scholars and the City of New Haven. This year’s honorees are Yale University’s Jennifer Gonzalez and the University of New Haven’s Zaamir Ali. Gonzalez, who recently earned a degree in Ethnicity, Race and Migration concentrating on Urban Inequalities, is the only Promise Scholar to serve the organization as a Yale Presidential Public Service Fellow. In that role, she interviewed local students and created a report on student retention and scholarship melt. She recently finished her training for Teach For America in Philadelphia area and will soon begin her classroom assignment. Ali, who earned degrees in mathematics and music, has taken advantage of the hiring initiative established by New Haven Promise and Yale’s Human Resources Department. He has held internships at the Yale University Art Gallery for four summers, often providing reports in regards to sustainability, efficiency and cost containment for the betterment of the Gallery and the environment. Like Gonzalez, Ali has had younger siblings follow in his footsteps to become a New Haven Promise Scholars. The Ivy Award — newly established in 2018 — goes to a person or department at Yale University, which has been at the forefront of the hiring initiative. Nearly 100 Promise scholars are serving in paid internships at the University this summer, including 11 in the Yale Library System, the inaugural recipient of the Ivy Award. Long removed from being a collection of books, the library systems allows interns to learn skills in geo-mapping, marketing and the many facets of today’s library. The final distinction, the Elm Award, is also newly-established to recognize an outstanding advocate who partners with Promise to develop our Scholars to take their place in their careers and in the city of New Haven. Cynthia Lowman of the Yale New Haven Hospital has done precisely that for scholars poised to enter the medical field. She has advocated for the Hospital’s intern initiative by identifying needs and placing interns — more than 20 the last two years — to fill the roles. “These college students are truly scholars. They are approved to be placed only if they maintain the required grade point average,” she offered. In addition to those awardees, the Scholar Celebration will include the introduction of the Promise Class of 2018, which includes more than 350 students. This entry was posted in News Release by New Haven Promise. Bookmark the permalink.